This definitely holds true for the indomitable Pete Seeger. He’s seen it all and done so much for so many people. Always a champion of the working class, of civil rights, of the environment, Mr. Seeger is still going strong at age 91. His voice may be a bit shaky now, but he’s recruited a group of friends and children from the Forrestal School in Beacon, New York (his adopted hometown in the Hudson Valley) to help carry on the ideals of empowerment and humanitarianism that he’s embodied for nearly 70 years. 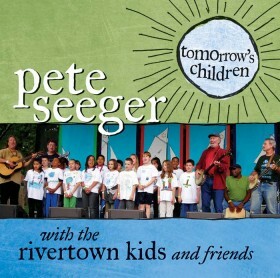 We at Awaiting The Flood are honored to offer one lucky reader a free copy of Tomorrow’s Children by Pete Seeger with the Rivertown Kids and Friends (Appleseed Recordings). Pete plays banjo and 12-string guitar on every track, sings a few songs, but mostly leads others in sing-alongs and does the spoken-word introductions. The kids are not professional singers, but the impact of Pete as village elder passing along his knowledge and spirit to the next generation is emotionally palpable throughout. Simply put, this collection is a treasure. So, drop us a line at Contests[at]CountryMusicPride.com (our parent site) or simply leave a comment here. Be sure to include your email address so we can contact you if you’re a winner. We’ll choose a winner by Labor Day — wouldn’t Pete be proud? Pete just keeps chugging along and good to see he’s keeping the flame alive with the children. What an exciting project – best wishes to Pete Seeger from a longtime fan!